As Leandra Medine once said, “Pants are dead.” And from the remains of the 70% off pile at your fave Swedish retailer comes a new street style trend that’s gotten the ladies (especially our petite sisters) opting to go pant-less. Enter “lampshading,” the 2016 version of the no-pants look. 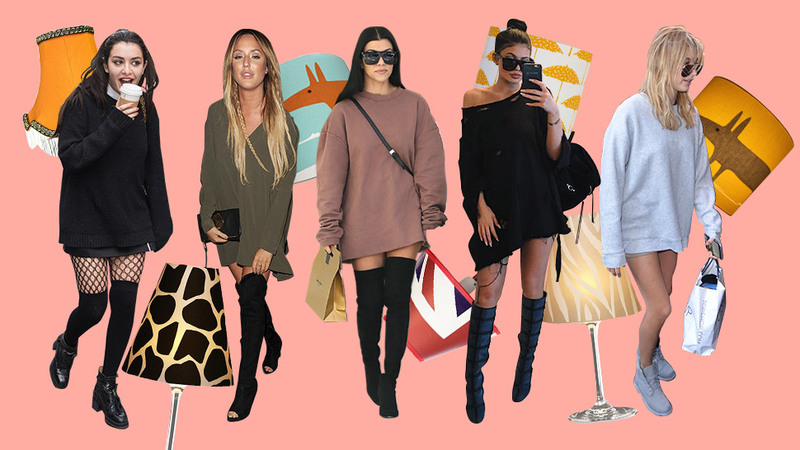 Snip off bits of the neckline to give your sweater a slouchy look like Kylie's. Rummage through your dad's or brother's closet for an oversized beat-up sweater that's long enough to wear as a mirco-mini dress. Peep-toe booties add an unexpected touch to this look. Too hot to wear anything past your knee? Swap thigh-hugging boots for industrial-streath steeltoes in a pastel hue. Bring out your inner school girl by paring lace-ups with thigh-high socks. Give it a try (chilly nights are up ahead, we heard) and holler back if anyone tells you you forgot to wear pants today.